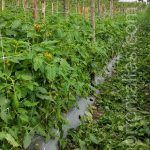 Using trellis netting for hydroponic tomatoes, a passive way to reduce labor costs. 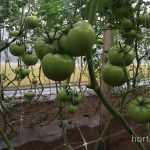 The old high-wire method of trellising hydroponic tomatoes with raffia causes plants to choke, and it increases the risk of mechanically spreading diseases. 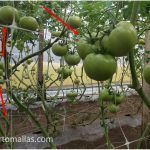 Tutoring hydroponic tomatoes (solanum lycopersicum L.) in greenhouses using high wire trellis support is an essential practice to keep the plant erect and well aired, being this the best way to keep total control over the health of a vegetable crop, avoiding hydric and mechanical stress over the plant by using raffia to tie it up.Advantages got from using this growing method are fastest plant growing and maturation, being possible to shorten it up to 60 percent comparing it to plants on natural environment. Among its competitive advantages are its uniformity, smell and taste. 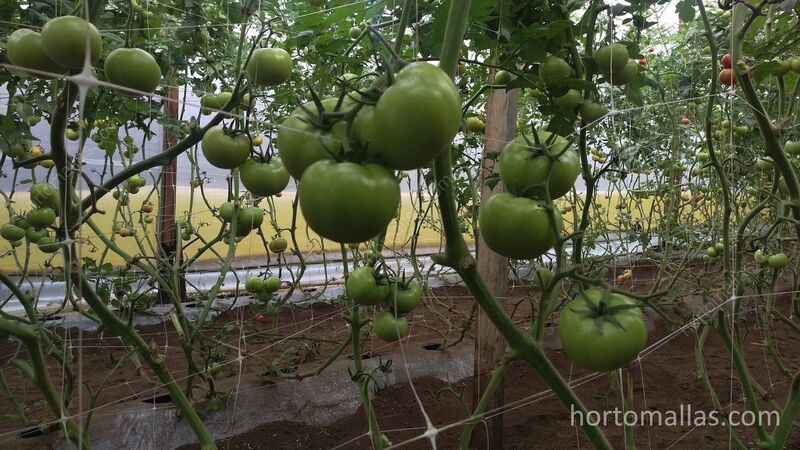 By using tutoring net or greenhouse hooks, the plant is held to the greenhouse trellis providing support to maintain its vertical or diagonal position allowing tomato fruit support. 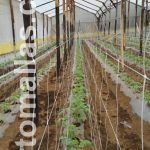 Tutoring tomato plants in double rows of trellis net reduces labor and the spread of disease by mechanical transmission. 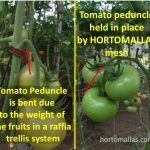 Besides the best plant health in the tomato crop, training tomato plants with HORTOMALLAS increases the size of the fruit, since in many cases the clusters staking with raffia come to hang himself under the weight thereof. The trellis net prevents the weight of the fruit broken branches providing the best support system. 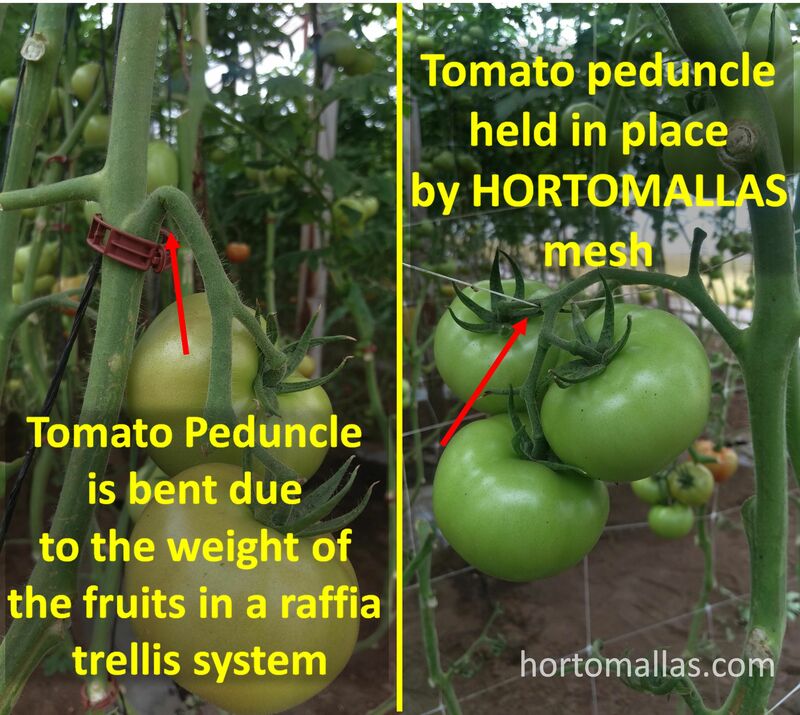 Besides improved phytosanitary conditions for tomato growing, tutoring hydroponic tomatoes plants using HORTOMALLAS increases fruit size, due to the fact that in many cases when using agricultural raffia to hold tomato clusters or bunches (high-wire hydroponic tomatoes) provokes the peduncle to be choked by the fruits´ own weight. 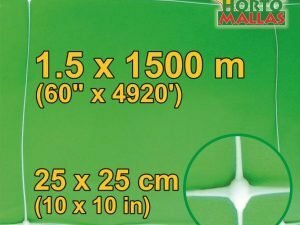 Using trellis net for hydroponic tomato growing gallery! 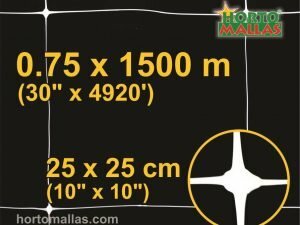 HORTOMALLAS trellis netting for tutoring inside a simple greenhouse. This is why by combining tutoring with nets and hydroponic crop methods , we can provide the roots all the time with the required constant humidity and nutriment levels, regardless of the weather or the crop growth stage, reducing the risk of exceeding irrigation, avoiding water waste and losing fertilizers, making sure complete radicular area is irrigated, reducing considerably diseases caused by soil pathogens or humidity on leaves and increasing production efficiency and highest quality products. 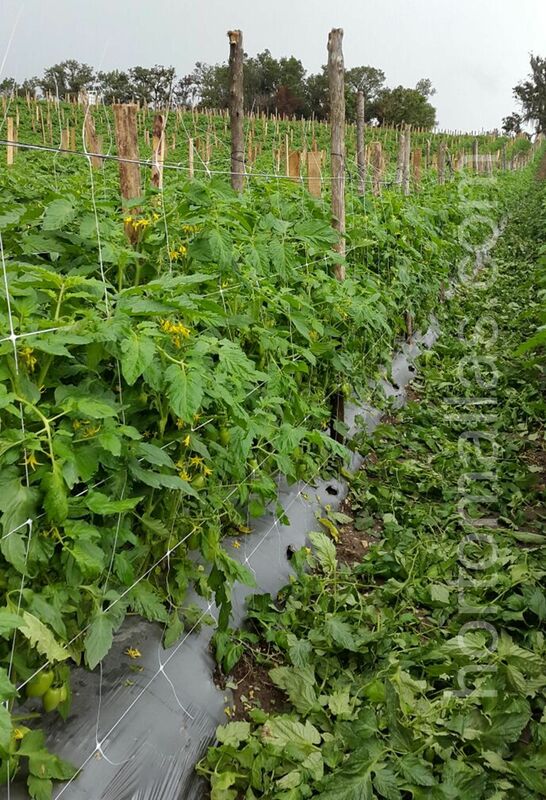 Disadvantages of raffia tutoring for greenhouse tomato growing in hydroponic systems. 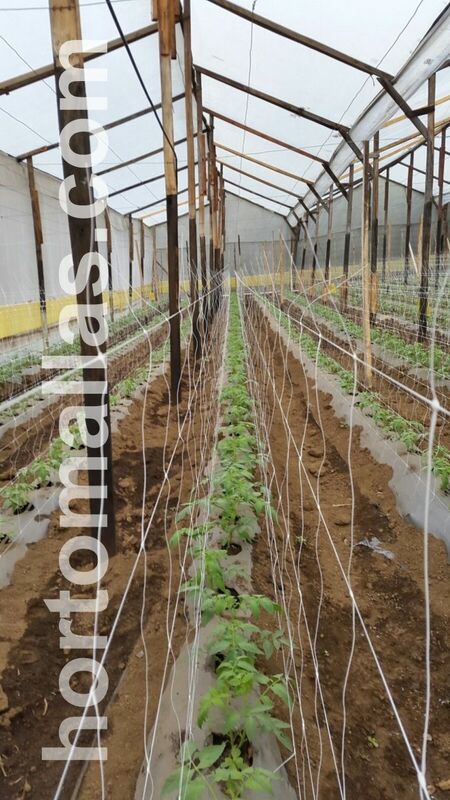 Agricultural raffia is traditionally used to support tomato crops in controlled environments such as hydroponic greenhouses, but beside the increased cost on labor, an excessive manual handling plant health problems appear, since the tutored plants using the manual raffia and hook system require to be in contact with operator´s hands which in many cases are transmission vectors for pathogen agents such as viruses, bacteria and fungi. 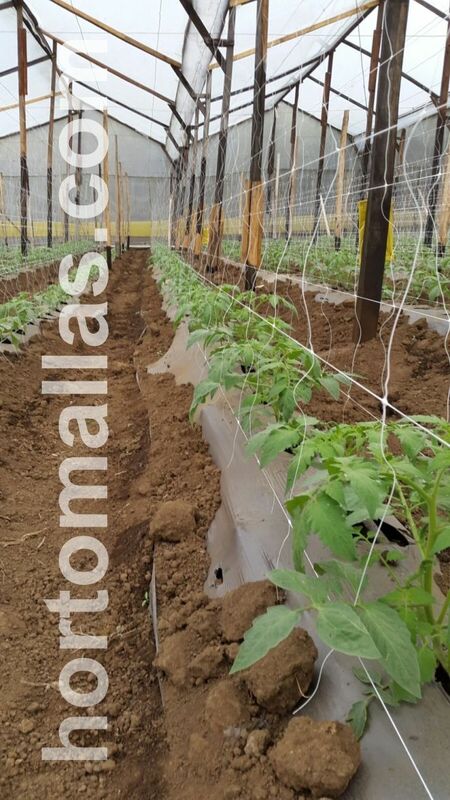 This is why using HORTOMALLAS double netting system in your tomato plants reduces human costs while at the same time, avoids disease spreading and mechanical stress. 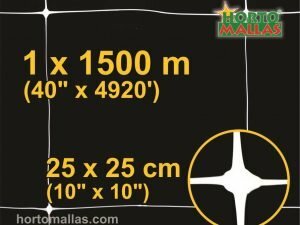 Also needs to be said that HORTOMALLAS trellis supports fruit cluster´s weight preventing footstalk or the peduncle from bending and choking the fruit. 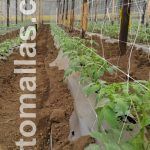 To summarize, tomato growing with HORTOMALLAS provides advantages that other methods will not have and will increase crop yields. The advantages of tutoring with trellis net are reducing labor and prevention of diseases transmitted mechanically. 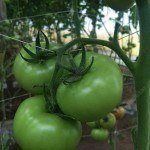 The advantage of tutoring tomato crop in double rows is that the plant gets the support it needs on both sides of the groove.